MGTOW - Why Fear Being Alone? SYRIAN GIRL: 8 Reasons Why The NWO Hates Syria! Last edited by synergetic67; 03-10-2015 at 03:23 AM. A Japanese artist has come under fire after using a photograph of a young Syrian girl taken by Save The Children to draw a cartoon accusing refugees of 'faking' plight. The drawing, by cartoonist Toshiko Hasumi, shows a young Syrian girl claiming to want to be a refugee in order to get 'gourmet food and luxury at the expense of someone else'. It has been widely shared online in Japan since being posted on Facebook by Hasumi last month, leading to more than 10,000 people signing a petition demanding it be taken down. 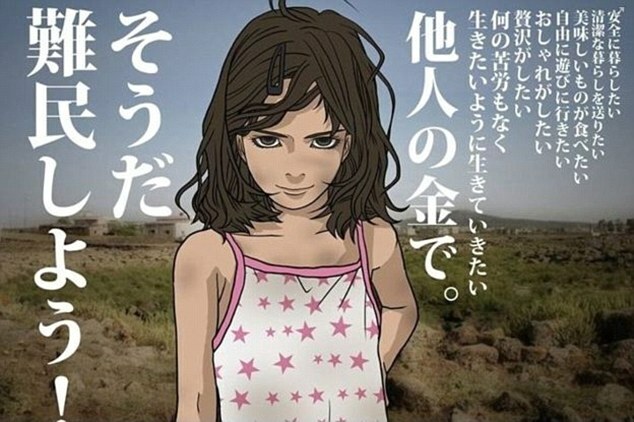 The manga cartoon is based on a photograph of a six-year-old Syrian girl taken by British photographer Jonathan Hyams for Save The Children at a refugee camp in Lebanon. The caption, purporting to be the thoughts of the young girl, reads: 'I want to live a safe and clean life, have a gourmet meal, go out freely, wear pretty things and luxuriate. 'I want to live my life the way I want without a care in the world — all at the expense of someone else. Last edited by turquoisefire777; 08-10-2015 at 11:18 AM. Bono in Bed with Monsanto! Last edited by synergetic67; 10-10-2015 at 02:39 AM. Last edited by turquoisefire777; 23-10-2015 at 04:34 PM. Last edited by synergetic67; 01-11-2015 at 05:11 AM. Very good information on this video. Some amazing links in here on a wide range of topics, I miss Google Video! Last edited by synergetic67; 02-12-2015 at 11:49 PM. Who Ordered the Double Cheese & Sausage? Last edited by synergetic67; 04-12-2015 at 11:49 PM. Last edited by synergetic67; 03-02-2016 at 01:07 PM.